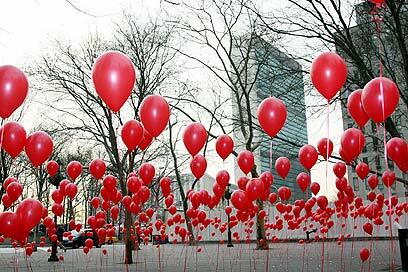 The Israeli consulate in New York released 4,200 red balloons Thursday, equal to the number of Qassam rockets fired at Sdeort since the Gaza disengagement, outside the United Nations headquarters in the city. The display aimed to protest the international community's disregard for Qassam fire at Israel. The protest was held while the Security Council convened to discuss the situation in the Gaza Strip. Consul for Media and Public Affairs in New York, David Saranga, said that the protest aimed to place the distress faced by Israelis on the American and global agenda. "To this day, all attempts to place this issue on the American media's agenda have failed," Saranga said. "Moreover, recently we saw increased coverage of the suffering of Gaza residents in wake of Israel's steps." According to Saranga, the display was meant to serve as an illustration of the lives of Israeli Gaza-region residents under the rocket threat. "We must stress to the world the suffering of Sderot residents, to illustrate to Security Council members the ceaseless rain of Qassam rockes, and to call on the international community to stop ignoring what's going on in Israel," Saranga added. Spokesman Yossi Cohen and informed him of the display of support. However, Cohen only had time to say that Sderot residents greatly appreciate the gesture of solidarity when the rocket alert system "Color Red" cut off the conversation. Thursday evening, a barrage of five Qassam rockets was fired at Sderot after roughly 45 hours of relative quiet in the western Negev. See all talkbacks "4,200 balloons released in NY to protest Qassam fire"